Happy Valentine’s Day! My daughter is having a Valentine’s Day party in school today, so I just wanted to share these cake pops adapted from my skinny cake pop recipe I did a few months back to bring to her class. Perfect for any holiday, just switch up the decorative colors. A few other Valentine’s Day dessert recipes I love making for the occasion are Homemade Chocolate Cake, Mixed Berry Pie, Vanilla Bean Panna Cotta and Chocolate Crepes with Strawberries. You can also check out this full list of Valentine’s Day recipes. 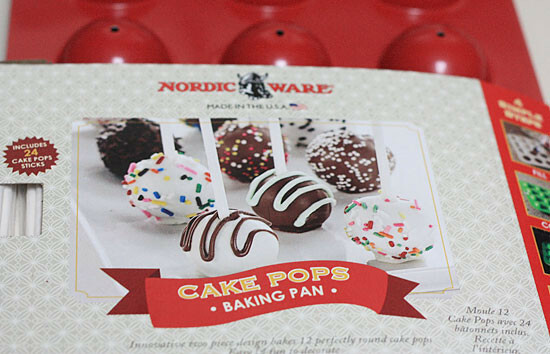 I love how you can come up with hundreds of different ideas with this Nordic Ware Cake Pop Pan I purchased at Target. I highly recommend buying 2 pans if you plan on making these to speed this up. I simply took my recipe and used colored candy melts in place of the white, with heart sprinkles. So cute! Melt some of the white chocolate melts in the microwave according to package directions, careful not to burn the chocolate. 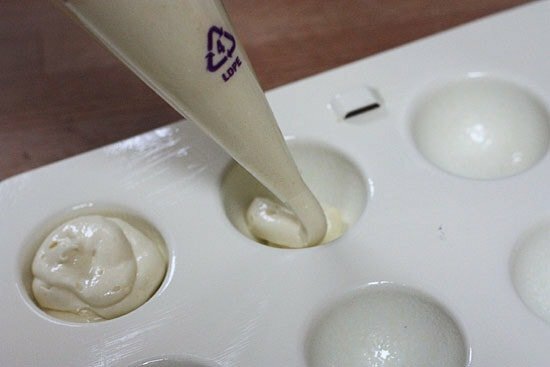 Insert the tip of a bamboo stick into the melted chocolate, then into the cake ball (this helps hold the stick in place) and dip each ball into the chocolate, then onto a sheet of wax paper. Repeat with remaining balls and chocolate. 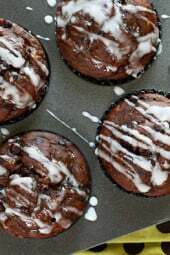 When the chocolate hardens, place into mini cupcake liners and top with sprinkles and drizzle with chocolate if desired. Would this recipe work the same if I used a red velvet or chocolate cake mix instead of the yellow cake mix? Or would anything change? They look delicious! Gina, I am definitely making these for a St. Patrick's Party! Also making your guacamole deviled eggs! Thank you for all your recipe inspirations! Can you use a mini muffin tin instead? OK these looked so easy and fun I started looking for cake pop pans since someone commented they found them on clearance! So I found some too at BBB. Bake Pop Pans. Unfortunately not the same ones Gina used, but was rated great and makes 18 at a time! So I ran out this morning and bought 2 @ $9.99 each plus the coupons they give. I am excited to try these with my girls and thanks for lightening these up!! I can't wait to try this recipe!! Do you think I could use gluten free flour and they would come out the same? I'd love to make them for a birthday or something.. Thank you for the recipe!! 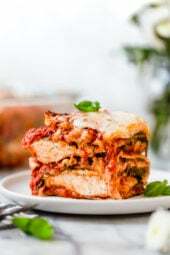 its really beautiful looking, i like it very much, hope that my friends will like skinnytaste site, i am going to share with my friends..
Love this recipe. I am going to make them for mu daughters 3rd birthday party next month. I am going to use pinks and purples. Also, I was able to buy the cake pop pans on Friday at Target in the Valentine Clearance section for 50% off. I also bought the Valentine sugars and sprinkles to decorate them with. Thank you again for all your posts. These are so cute! What a perfect treat. I love your web site. It is absolutely beautiful! I recommend it to everyone that I work with and I always check your site when I'm looking for a new recipe. Just want you to know how much I appreciate the creativity that you put into the work you do. Amazing! 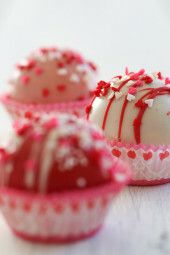 Oh Gina, this has to be one of the cutest recipes I've found for cake pop Ideas, they're like little cake truffles. Thank you for the tips and directions. I am a big proponent to portion sizes (mostly because it's hard to moderate my eyes to stomach ratio). Cake pops are a perfect little treat. I've had my eye on the pan at Target for sometime and put off getting. I think I will now. Any tips for melting white chocolate? So adorable! 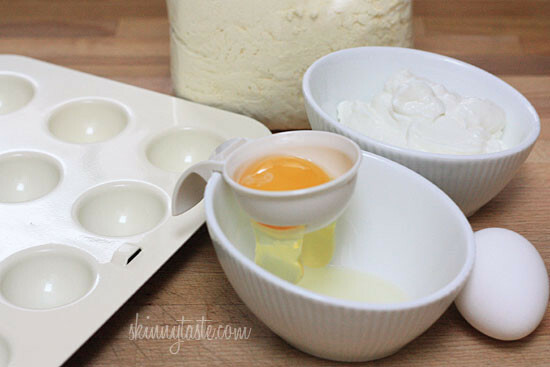 What cake pop pan do you use? I haven't found a good one yet. These are just lovely, Gina! I bet the kiddos LOVED them. Those must have been some happy kids to get those! Beautiful! 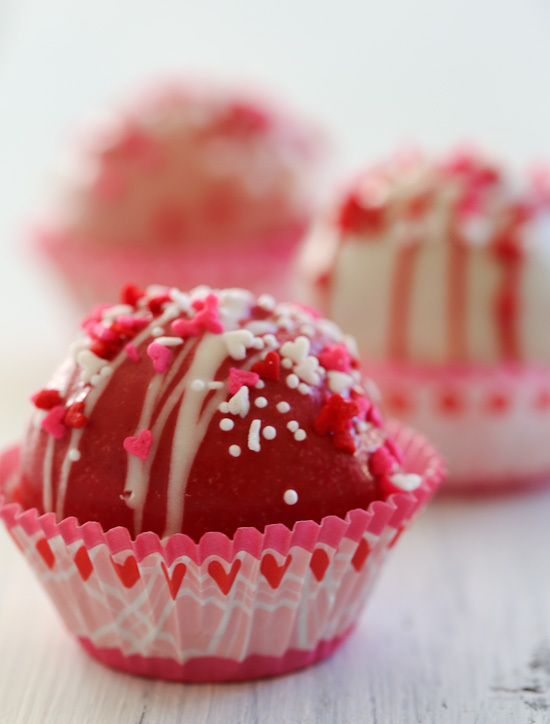 Gina- I tried making red velvet cake balls in a similar way for Valentine's Day and they did not turn out. 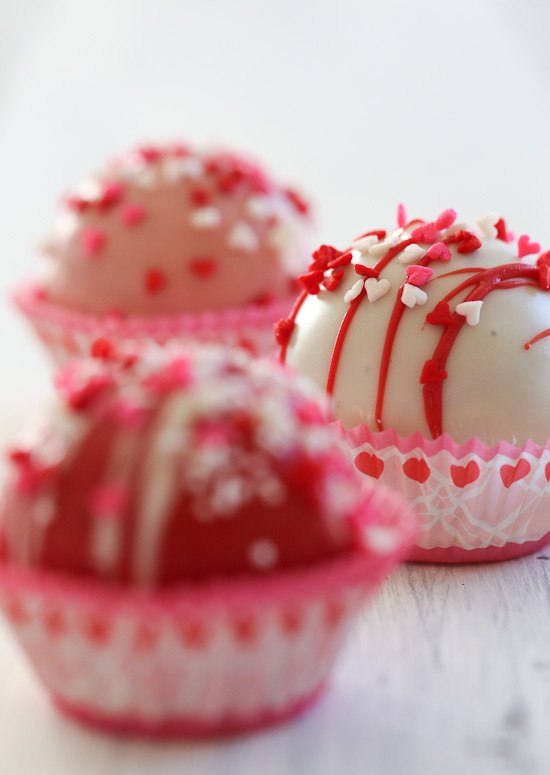 Do you have a cake ball recipe for red velvet ones? Thanks! These are darling! I also wonder how you make them without the stick (as in your photo)! And love the idea of Easter/pastel ones! Sorry I fixed the directions, I used a bamboo skewer to hold it, then covered the hole with a little more chocolate. I wanna make some Easter cake balls now! I'm thinking Pastels all the way! Ha, I was thinking the same thing!! I love the egg separator too! I also would like to know where you purchased that egg separator? One more question, then does the stick come out easily after the balls are coated with chocolate?? Do you put the stick in chocolate, then into cake ball and then refrigerate before you dip the balls? I used one bamboo skewer for all of these, I fixed my directions, I don't think I was clear. 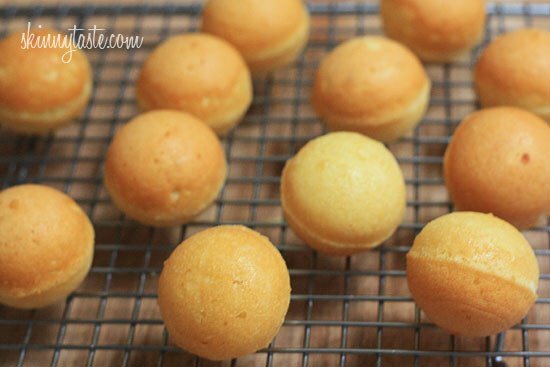 The cake balls in your beautiful photo don't have sticks. Whats your technique for dipping the balls? Or were the sticks removed after the candy melts dried? I used a bamboo skewer to hold it, then covered the hole with a little more chocolate. I made your skinny egg nog cake which is the same cake recipe you use here (minus the nutmeg of course). I have tried other options in the past to make cakes, such as pumpkin. The cake came out heavy. Your recipe is so light and fluffy! These are the healthy swaps I will use from now on. Thank you and thank you for freely sharing your recipes. Happy Valentine's Day! I lovvee cake pops. It makes eating cake even easier! those are so festive! did they taste good? So cute! I tweeted you a picture of the ones I made from your recipe last night too – came out adorable! Tienen que estar riquísimos! Happy Valentine Day! Those are so cute. I bought that Nordic Ware cake pan and made some cake pops a few weeks ago for my daughter's class. It was a big mess, and I vowed never again to make cake pops. Is there some trick to dipping them? Mine kept falling off the stick and the candy melts were all goopy. It says not to thin it out, but I don't see how you can dip them otherwise. Maybe freeze them after inserting the chocolate-coated stick? You have to dip the sticks in melted chocolate, then into the cake pop and refrigerate. That is the "glue" that holds the sticks in place. Melt the candy melts slowly and stir constantly. 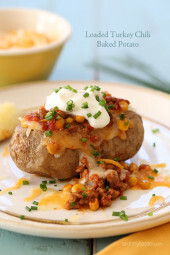 If you use a microwave, melt in 30 second increments and stir between each time. You can thin out the melts with a bit of Crisco but not water! Water will cause them to be a lumpy mess. Where did you get that egg white separator? I love that it sits on the bowl. Oh lord those look so wonderful!